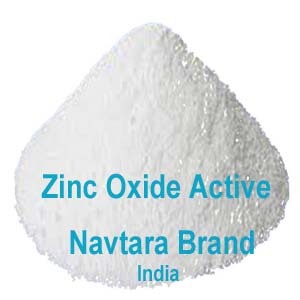 Zinc Oxide active is available for rubber applications. In the first place the hydroxyl (OH) groups are introduced by precipitation process which are the centre for rubber linkages. Heavy metals (known Rubber Poisons) do not get removed in WS (White Seal) grade. These are like Ferrum, Cuprum, Lead and others. They slowly eat off the vulcansied rubber and badly effect the rubber ageing. In our active grade the Zinc particles, become active and reflect back the UV rays from sun. They also help in protecting rubber under the conditions of heat rays. By precipitation the individual particle becomes microfine.Thus they easily disperse in rubber and impart the required charcteristics. Zinc is known to be the best activator in rubber vulcanisation. The aging properties, not immediatly visible in vulcanised rubber, is the main advantage of the Active grade.